The front sway bar performs a very important function on a street Cherokee. It controls the body roll to improve the handling. 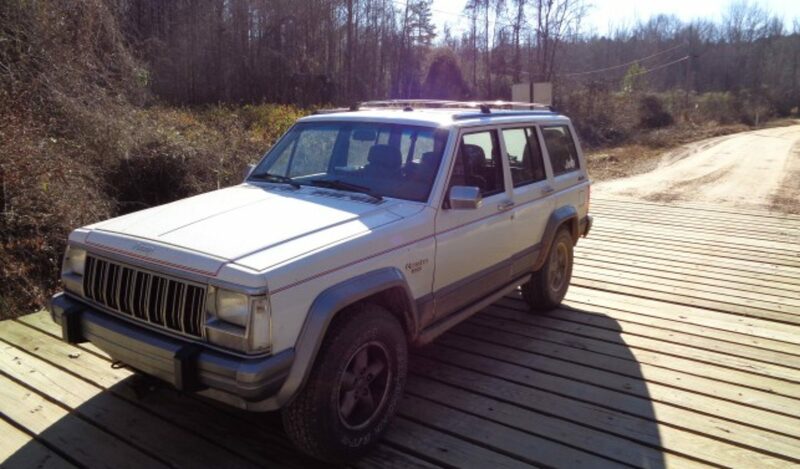 The later model Jeep Cherokees used a larger diameter bar to further improve on road handling. The bracket was also modified to help keep the bushings in place during times of extreme articulation. The combination of a larger bar and a larger bracket means there is very little clearance between the bar and the bracket. The bushing is also smaller so it wears faster. As the bushing wears, the bar can contact the bracket and make a rattling sound on rough roads. Replacement bushings are now available form Crown Automotive as well as the Jeep Dealer. To replace the bushings, leave the vehicle supported by its axle. If a lift is used for access, the axle needs to be supported in the normal position to avoid having stress on the brackets. Remove brackets one at a time. To remove the bracket, loosen the two 15mm bolts and slide the bracket off the bushing. Pull down slightly on the sway bar and slip the worn bushing of the bar. Slip the new bushing over the bar and slid it into the proper position. Slip the bracket back over the bar and bushing and reinsert the bolts. Be careful to properly engage the threads before tightening. Repeat the procedure with the other bracket. The end link bushings may also need to be changed as well. The bushing that attaches to the axle usually does not wear out. However if it does the best way to change it is to replace the entire sway bar end link. It will come with a new bushing already pressed in place. I like to replace the end link bushings with polyurethane instead of the original rubber. However the procedure is the same using either the stock rubber replacements or the poly upgrade. Remove the top nuts on both ends of the sway bar. Remove both upper bushings. Raise the sway bar up off the end links. Remove the bottom bushings. Replace both lower bushings. Lower the bar back in place. Now install both upper bushings. Replace both retaining washer and nuts. Tighten the nuts until the bushing just begins to compress. When driving off road when more articulation is needed, disconnecting the front sway bar will greatly improve front traction and handling. To disconnect the front sway bar, remove the retaining nuts at the lower part of the end link where it joins the axle. This bolt has a torx head but is normally pressed into the axle so that it will not turn. Just remove the 18mm nut. Slip the end links off the bolts and secure the sway bar in its upper most position with an elastic cord. If you go off road often, you can make removal and reconnection faster by replacing the bolt with a ½” pin available at most farm supply sources. Drive the original bolt out of he axle connection and replace it with the pin. Then you will be able to quickly disconnect and replace the sway bar connection by simply removing a clip and pin rather than having to use a wrench. The front axle of a 4wd Jeep is fitted with a universal joint to allow the wheels to be turned and still have torque applied to them. These joints do a lot of flexing and will wear out in normal use. To repair the U joint first remove the axle shaft from the Jeep. See my other articles for this procedure. There are many different methods used to change the axle U joints. Your experience may vary depending on what tools you have available. The method described here is the one that works best for me. I begin by cleaning the yokes with a wire brush and applying penetrating oil to the outside of the caps. Next, I clamp the shaft in a vise and remove the inner C clips. I use a hammer and a screwdriver to tap the clips out. Sometimes a clip will be stuck in the groove and I will have to wait until I move the cap slightly to get it out. To remove the first cap, I clamp my ball joint press in my vise. Then I use the press to put pressure on the cap. I like to remove the cap from the main shaft first because the stub shaft is easier to handle later. I tighten the press just enough to put pressure on the cap and then I use a hammer to strike the end of the press. The hammer blow is what actually moves the cap. Putting too much pressure on the press can damage the yoke or the press, so I use the press to apply pressure and then hit it to move the cap. Once the caps are moving, I turn the press to force the cap the rest of the way out. The cap will not come all the way out before the cross hits the yoke however. Be sure to stop turning the press before it hits so the yoke is not damaged. I use a pair of vise grip pliers to remove the cap the rest of the way from the yoke. Next, I press the cross back the other way to remove the second cap. Be sure to use care lining up the other cap for its trip back through the yoke as it is easy for it to twist and damage the yoke. With both caps out, the cross can be removed from the yoke. I then repeat the procedure with the stub shaft caps. To put the new joint in, you first have to remove two of the caps. Be sure to keep every thing clean and make sure the needle bearings stay in place. I begin by setting one of the caps down on the anvil part of my vise. I set the cross section in place in the yoke and then carefully lower the hole in the yoke over the cap and align the cross into the cap. Then, I use a hammer to hit the opposite side of the yoke and drive the cap into place. This method keeps the needle bearings in place and gets the cap in most of the way. Flip it over and do the same with the other cap. However, do not pull the cross all the way out of the first cap. Keep it part way in to hold the needle bearings in place. With both caps in the yoke, I use the press to center them up and then I install the C clips. Once the clips are in place, I tap the assembly with a hammer to relieve any tension set in by the press. Next I repeat the process with the other two caps in the other yoke. If working with a long side shaft it is sometimes helpful to have an assistant to help align the yoke with the cap as you are preparing to tap it in place. Once all the C clips are installed, test the joint to make sure it operates freely in all directions. If there is any binding, tap the yoke with a hammer to see if there is any residual pressure binding the caps. If a C clip will not go in place, do not force it. It may be that a needle bearing has fallen down while handling the cap and is preventing the cap from seating. Remove the caps from that yoke and inspect them. Put the needles back in place and reassemble. Once the new joint is in place and moving freely, you are ready to reinstall it in the axle housing. See my other articles for this procedure. If the new U joint has a grease fitting, fill it with grease before installing the axle shaft in the Jeep to make the fitting easier to access.